Sverdrup township was created by the county commissioners on March 18, 1878, under the name of Norman. The laws of Minnesota provided that the commissioners had to return the names of townships to the state auditor for his approval. The latter official had the authority to approve or reject the name, the rejection being determined by the question as to whether there was another township in the state of the same name. In the case of Norman township the state auditor reported to the county commissioners that another township of the same name already existed, and on July 17, 1878, the present name, Sverdrup, was given the township as set forth in the following resolution: "Resolved by the board of county commissioners of Otter Tail county that the congressional township 133, range 41, organized at the last meeting of board be named Sverdrup as the first name (Norman) was not accepted by the state auditor, another town in the state having the same name. Adopted, July 17, 1878." The first election was held at the house of Olaf Bjornaas on April 6, 1878. Although Sverdrup was not officially created until 1878, a petition had been presented to the commissioners dated December 7, 1872, asking that township 133, range 41, which was at that time attached to the town of Tordenskjold and which contained at the time more than twenty-five legal voters, he organized into a separate township under the name of Norman. This was signed by the following; men: John Qlsen Kolstad, Aug. Nordenmalm, Jens Gveld, O. H. Jornaas, Ole Olsen Aune, Ole T. Homperd, Peder M. Henriks, Ole F. Loseth, Knud Knudsen, Bernt O. Sundeye, H. E. Nilson, Halvor Marken, Johan Marken, Ole Aiene, Jens Jensen, Johan Schroeder, John E. Hill, Iver L. Kotitad, Mattias Olsen Minge, Ole Johnsen Butterud, Petter Lorssen, Ole Pedersen, Kaisten Halstensen, Knud Peterson and Andrias Olsen. This petition was rejected on March 18, 1873. The second petition which resulted in getting the township organized, was dated February 5, 1878, and contained the names of the following qualified voters: A. W. Peterson, Hans Juelson Oscar Hanson, Johan E. Hill, Charley Johnson Hill, Johna O. Nilsby, Ole F. Hamperd, Ole J. Butterud, Ole T. Bjornaas, Ole F. Loseth, Ole O. Aune, Ole Nygaard, Jens E. Wold, John O. Stompord, Peder M. Hendricks, James Randak, Even Johnson, John Sanao, T. C. Logge, Lars Hansen, Peder Sande, M. O. Sjolberg, Jorgen Hanson, Halste Halstensen, Halvor Marken, Knud Pederson, Johan Marken, John Olsen Kolstad, Knud Knudsen Onstad, Lars Johnson Medja, Edward J. Wold, John J. Wold, Ole Gjordal and Andreas O. Seem. The tax duplicate of 1878 gives the following taxpayers for Sverdrup township for that year: Ole O. Aune, Ole Bjornaas, Ole J. Butlevud, Ole Erekson, Peder M. Hendrikson, Jorgen Hanson, Halstensen Halshens, Lars Hanson, Carl Hill, John E. Hill, Jens Jenson, Even Johnsen, Habs Juelson, Renerth Johnsen, Johan O. Kolstad, Knud Knudson, Petter Larsen, John Marken, Lars J. Medjan, Halder E. Nilson, Ole O. Nygaar, Johan O. Nils-bye, A. W. Petterson, Ole Pederson, Knud Pederson, Beruth Sunelbye, M. O. Sjvlberf, T. C. Sagge, Petter P. Sande, Ole J. Stompra, Andreas Skramstad, Ole Sjordaal, Jens E. Wold, Ole Loseth, J. H. Low, Peder J. Nilsen and John Schroeder. Sverdrup township has more than its share of lakes and there is not a section which does not contain a lake or a part of one. 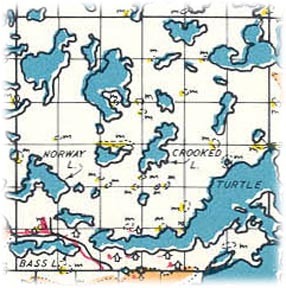 The largest lakes in the township are North Turtle, South Turtle, Anna, Dagmar, Norway, Bass, Onstad, John, Crooked, Horseshoe and Lost. The whole township drains into Red river which runs through Maine township about a mile north of Sverdrup. There is very little level land in the township although it is not so rugged that it cannot he brought under cultivation. The preponderance of the population has always been Norwegian, the people from that country being its first settlers in large part. The first village was Southvick, the forerunner of the present village of Underwood. The postoffice established at this place was known as Turtle Lake. After the building of the Northern Pacific through the southern part of the township in the early part of the eighties, Southvick was platted as Underwood. The only other place in the township which has aspired to urban honors was Maplewood, which appeared on the maps of the county in 1882 as a station on the railroad, but soon disappeared. The present township officers are as follow: Supervisors, Ole A. Berg, John Sem and Henry S. Bye; clerk, A. F. Lund; treasurer, Gust Onstad; assessor, Otto Nilsby; justices, Ole Aune, Jr., and Elof Hagen; constables, Theo. Westerhaug and Anton Haukebo. The village of Underwood, located on the branch line of the Northern Pacific in the southern part of section 32, was laid out by Robert Miller for Timothy and Lydia H. Kellogg in the fall of 1881. The village was incorporated as a result of a petition signed September 30, 1912, by the following legal voters residing in the proposed incorporation: F. E. Solomonson, C. E. Pederson, Carl H. Christiansen, O. C. Olson, O. J. Lein, George Kugler, H. Ledding, Odin Loseth, Conrad Skalman, P. K. Onstad, Gustav Schmidt, Christ Jensen, H. Hawkins, E. S. Evenson, Nils Wilson, O. C. Pries, Jens Jensen, Theo. Sjordal, H. C. Secoy, G. K. Haukebo, S. L. Brydahl, John J. Anker, H. N. Pederson, Siverin Lokken, H. L. Anker, H. Hendricksen and Henry Dahl. The petition stated that the village contained a total population of two hundred and four and that the territory asking for incorporation comprised three hundred and twenty acres. The petition was presented to the commissioners on October 8, 1912, and at once granted. The board set Tuesday, November 12, 1912, as the date for an election to determine whether the village should be incorporated. The result of the election showed twenty-eight votes in favor of and ten against incorporation. This town has grown to such proportions in the last few years that it is a rival of many of the towns which were laid out at an earlier date. The population at present numbers nine hundred. There is a Norwegian Lutheran and Unitarian church in this town. There is a bank, hotel, feed mill, creamery and two elevators. E. T. Evenson is the present postmaster. The present village officers are as follow: President, Nils Wilson; trustees, G. Gilbertson, Gustav Schmidt and F. E. Solomonson; clerk, E. S. Evenson; treasurer,. C. J. Moen; assessor, Hans O. Olson; justices; W. A. Lee and C. H. Christensen; constables, Carl Mortenson and Oliver Bergem. Places of birth for Sverdrup Township in the 1905 state census.